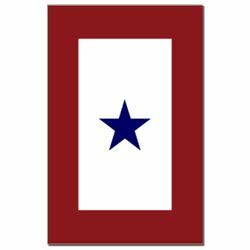 The Service flag, also called the Blue Star Flag, was designed and patented by WWI Army Captain Robert L. Queisser of the 5th Ohio Infantry who had two sons serving on the front line. The flag quickly became the unofficial symbol of a child in service. President Wilson became part of this history when in 1918 he approved a suggestion made by the Women’s Committee of the Council of National Defenses that mothers who had lost a child serving in the war wear a gold gilt star on the traditional black mourning arm band. This led to the tradition of covering the blue star with a gold star on the Service flag to indicate that the service member has died. 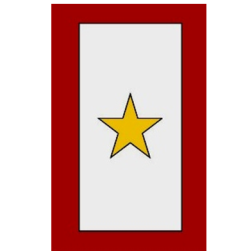 If several stars are displayed by one family the gold star takes the honor of being placed at the top. The gold star should be slightly smaller than the blue star to create a blue border surrounding the gold star.